Lasse Rabenstein is co-founder and managing director of the company Drift & Noise – Polar Services GmbH (DNPS). Lasse received his PhD in 2010 at the University Bremen, Germany, in collaboration with the Alfred Wegener Institute for Polar and Marine Research where he developed Airborne Electromagnetics as a method for Arctic wide sea-ice thickness retrieval. During seven years as a lecturer at ETH Zurich, Switzerland, Lasse came into contact with the technology start-up scene and developed the idea for an Operational Ice Map product. Since 2016, he works full-time for DNPS. Panagiotis Kountouris is the head of remote sensing at DNPS. He manages the development of the operational ice map product and is an experienced geospatial software developer. He works for DNPS since November 2016. Panagiotis has a strong scientific background and is the author of several scientific publications covering the subject of atmospheric spatial data handling. He completed his PhD in 2016 at the Friedrich Schiller University in Jena, Germany, in collaboration with the Max Planck Institute for Biogeochemistry about Regional carbon balance: flux optimization and network design. In this contribution to Polar Prediction Matters, Lasse Rabenstein and Panagiotis Kountouris provide insight into new sea-ice forecast products that might become instrumental for tactical decision-making in and near ice-covered waters. As a provider of real-time sea-ice information, the authors and their company DNPS work closely together with marine operators. Here, you can read how DNPS aims to deliver improved sea-ice forecast products that bear a striking resemblance to radar-based rain forecasts. The reduction of the sea-ice cover and predicted ice-free summers in the Arctic within the 21st century holds a large market potential for the Arctic regions. The Arctic Ocean is a shortcut for international shipping lines on three alternative routes: The North-East Passage, the North-West Passage, and the Trans-Arctic Route. Furthermore, twenty to thirty per cent of the remaining oil and gas reserves are estimated to be in the Arctic. In addition, the pristine Arctic environment and the adventurous flair of one of the world`s last wildernesses attract more and more expedition cruise operators. However, ‘ice-free’ does not mean that there is no ice. Still, the ice remains the biggest hazard for every Arctic venture. On January 1, 2017, the Polar Code came into force which has made decent ice information mandatory for every activity in Arctic waters. Ships transporting goods to, from, or through the Arctic seek for the fastest and safest way through or around the ice. Even the most powerful service ice breakers save considerable amounts of time and fuel when they choose an easy path through the ice as opposed to a straight path. Expedition cruise operators promise their passengers an adventurous but safe journey. That means, cruise ships do seek the ice but at the same time never want to get trapped in a dense ice cover. Unfortunately, sea ice drifts several kilometres a day; and all information on board is already outdated the moment it is available. Arctic stakeholders, however, are in an urgent need for up-to-date ice forecasts. While several sources for ice information exist on the market, presently, there is no high-resolution ice forecast product available on the market. The multitude of providers of operational model-based sea-ice forecasts worldwide might disagree on the last sentence in the previous paragraph. However, typical scales of situations marine activities in the Arctic encounter are in the orders of tens to hundreds of meters. Sea-ice modellers will agree that the currently available operational models hardly produce results on the latter scale. A good example is the need of an ice breaker to find the most economical way through the ice (Figure 1). Open leads in the ice cover, often only a couple of hundred meters wide, are preferred pathways for ice breaking vessels. Whether such a crack closes or opens up within the next 24 hours is crucial information. Open leads are visible on satellite images but are not represented in model-based sea-ice forecasts as most forecast models only have a resolution of several kilometres. Cruise ships are another example for the need for high-resolution ice forecast products. The tourism industry has an interest to visit attractive sites, such as a beautiful bay with floating ice bergs or a narrow strait. The question whether such sites are safely accessible over the next 24 hours or more is essential here. Again, sea ice which determines the accessibility of a bay or strait is visible on a satellite image but not in a common forecast product. The ESA Kick-start project Predictive Ice Images (or PRIIMA) aims at combining high-resolution satellite images with lower-resolution operational sea-ice models. In other words: PRIIMA will deliver ice forecasts with the resolution of a satellite radar image, as if the satellite recording of tomorrow would be available already today. Figure 2 shows an example of two subsequent Sentinel-1 radar images in the Hinlopen Strait, Svalbard. The concept is pragmatic in the sense that it establishes a helpful product developed in close collaboration with our test users from the field of cargo shipping, research ice breakers, and expedition cruises. Nevertheless, the PRIIMA challenge is not trivial and a step-by-step approach towards more and more complex situations is chosen. Figure 2: Ice cover in the Hinlopen Strait (Svalbard) as seen in two Sentinel-1 scenes 24h apart (Source: DNPS). 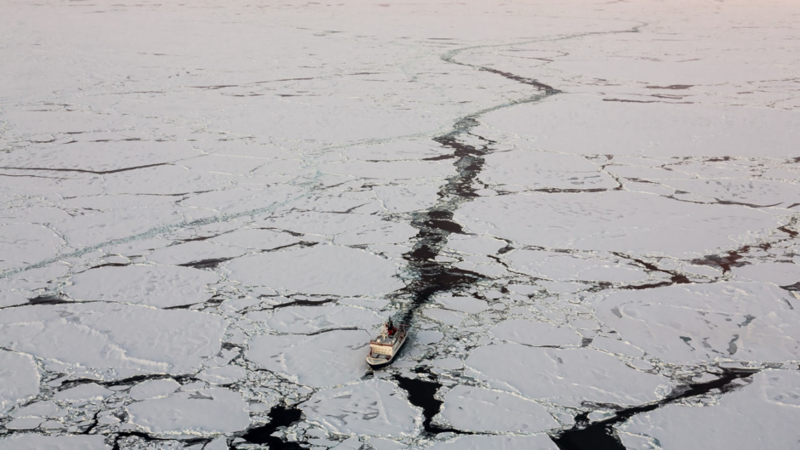 The first challenge the PRIIMA project approaches is nowcasting ( which is ‘forecasting’ of current conditions based on the most recent observations) in areas with free drifting sea ice, several hundred kilometres away from a coastline. Ice breakers operating in such areas have difficulties in navigating tactically on the basis of satellite images because of the large offset between the present position of the ice and its position during recording of the satellite image. PRIIMA corrects for that offset by applying (1) wind forecasts from the operational ICON model operated by the German Weather Service (DWD) and (2) ice-drift data from the operational TOPAZ model distributed via the Copernicus Marine Environment Monitoring Service (CMEMS) to Sentinel-1 radar satellite images. According to our experience, in free-drift conditions best prediction results are obtained by applying on-board recordings of the wind direction and speed on the image. However, model-based forecasts will be important when it comes to more complex non-free-drift situations where the ice is more densely packed or interacts with coasts. During the second phase of PRIIMA, its nowcasting ability will be expanded to forecasting, first again for free drifting ice in the open ocean where preliminary results are already promising (Figure 3). Eventually we will tackle situations in coastal areas utilizing image-warping algorithms that are able to account for the more complex drift patterns encountered there (Figure 2). Figure 3: Ice cover in the Arctic Ocean as seen in a Sentine-1 scene, and a forecast based on the same image but valid 24h later. Red points are four ice features identified on the original image of the first day, yellow triangles mark the positions of the same features on a subsequent radar image 24 hours later, and the green dots mark the predicted location of the 4 features (Source: DNPS). It appears questionable that model-based sea ice forecasts by themselves will ever attain the level of detail and accuracy needed to render PRIIMA-type forecasts obsolete – just like radar-based short-term rain forecasts will remain hard to beat by weather forecast models in the foreseeable future. We thus anticipate that high-resolution ice forecast products of this type will become an instrumental tool for tactical decision making for marine operations in and near ice-covered waters for the coming decades. Drift + Noise Polar Services GmbH (DNPS) is a start-up and spin-off company of the Alfred Wegener Institute for Polar and Marine Research (AWI). The mission of DNPS is to leverage technology from basic polar research, geophysics and remote sensing following the mantra ‘The impact of a paper is not enough’. One backbone of DNPS is the so called OSSI software (=On-Site Sea-ice Information). It guarantees its users a delivery of ice information in near-real time seven days a week. PRIIMA is planned as a new module in the OSSI system. The long-term vision of DNPS is to push the maritime industry forward into the shipping 4.0. scenario and to attach satellite and other environmental data to existing and emerging maritime information networks. A very nice article! I do agree with your controversial statement about forecasting systems not being precise nor accurate enough for this purpose. Thanks for the comment. That is exactly why we believe that a combined usage of satellite images and model forecast can be a solution. I think the comparison to the short-term forward calculation of rain radar patterns, which is a functionality of several nowadays wheather apps, is a very good one. It was actually Helge Goessling from AWI who made this good comparison and not me, I must admit. Thanks for this article! Very nicely written; it perfectly presents the need for high resolution ice forecast products to guide daily decisions taken by cargo ships, research ice breakers and expedition cruises. But moving from forecast for the next 24 hours…do you think that sea ice predictions at longer time scales (e.g. seasonal) can be of any use in order to plan an economic path through the Arctic ice pack? If so, which would be the limitations of such predictions (i.e, resolution again?). If not, which kind of information could they provide to these users? An interesting comment which addresses a big need in Arctic shipping: Seasonal forecasts. Why is it a big need? In cargo shipping, cruise industry but also in polar research strategic plans are made months if not even years before. These are plans which involve a lot of investments. Typically in January/February we receive inquiries such as: Can I promise my customers a successful north-west-passage cruise this summer? Is the ice-free season this year long enough to make two cargo transports into the Arctic instead of only one? So far, I have not met sea-ice forecasters who would advice to go into such strong contractural obligations on the basis of a seasonal forecast. I am not a modeller myself, but I think that the resolution of seasonal forecasts are often not sufficient for questions of trafficability, as very often it is a single strait or other bottlenecks on the route which decide about go or no-go? I believe that planning of the yearly shedule of cargo shipping and expedition cruises will rather be based on long term statistic from the past rather than on a seasonal forecast. New passages and cruise destinations will only be started if the passage was ice free for a number of years in a row. I am happy to hear other opinions. Nevertheless, short term forecasting is a great operational tool to support users who are already in or close to ice infested waters.